As 2/3 maybe this doesnt pass vanilla its unplayable. Very high potential, honestly, but since it seems no more magnetize cards are being printed, the support simply won't be there. Still the fact that this is one of the easier ways to gain armor right now may still result in this seeing play. In Boomsday, Warrior lacked a 2 mana mech to magnetize, this into Bronze Gatekeeper is a solid play for the board. This will likely see play in the Bomb Warrior. As a 2/3 I'd say it's good. As a 2/2, I think it's bad. Fusing it with Bronze Gatekeeper sounds like a cool idea, but most of the time, it will be a 2 mana 2/2 with Deathrattle: Gain 2 armor. Better than Hero Power, but not good enough for a deckslot. It's maybe kind of a baby zilliax but worse? There are certainly worse cards. But this seems too weak to make your 30. They needed a trash mech for warrior to balance the discover options...with 2 health this is pretty trash, might see play but in an aggro meta this is unplayable. Roughly as good as Plated Beetle. deal damage, meaning it also gives armor when traded into, but at the same time this seems inferior to the 1/3 for 1 in most cases it's a 4 stats 2 mana card. Additionally, it can create a bulky defensive threat with Beryllium Nullifier (5/10 hexproof), an anti-token card with Missile Launcher, or a big attacker with Wargear. 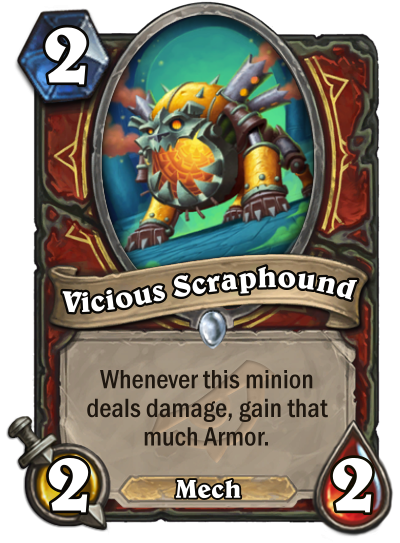 Beyond that, we will likely see this card played simply because it is a mech and warriors have the ability to discover a ton of mechs using cards that weight class minions. Good after playing Boom, good with Zilliax. At 2 mana it's cheap enough to have potential. Alley Armorsmith 2.0 in a way. Same effect, smaller minion with no taunt. I really liked this effect so i am happy to see another card with it. Mech synergy should be cool. i don’t think i ever want to put this in a deck but it’s nice that this exists for some slightly higher Armor consistency from Boom Hero Power. Its great with Dr Boom or Omega Assembly, but running as is its not that great. IF Mech Warrior is a thing, it's fine. You just can't think of it as a 2-drop. It's reaaaally good with magnetize minions and Dr boom hero, but it's reaaaaaaaaally bad on it own. This card is stuck in a weird place between defense and aggression.